So you ask, what is Zinc and why should I add it to my engine at oil changes? There has been a lot of confusion in the last few years about the lowering of zinc and phosphorus levels in modern oils and how these lower levels relate to classic and performance engines using standard flat tappet lifters – that is, just about every car built before the Eighties. The concern involves the use of the new lower zinc/phosphoruscontent ILSAC (multi-viscosity) oils, readily available on shelves at auto parts stores everywhere, and how compatible they are with these older engines. When anyone mentions zinc, they are actually referring to zinc dialkyldithiophosphate, a compound invented by Castrol for use in mineral-based oils, or zinc di-thiophosphate (ZDTP), which is normally used in synthetic oils. Both have been used as an anti-wear ingredient in engine oil for many years. The zinc and phosphorus ingredients appear to be most effective when they are used together. ZDDP/ ZDTP is one of many additives that are put into conventional motor oil to improve its lubrication qualities. Other ingredients, such as boron and molybdenum, are also added as lubricant enhancers. What was discovered through oil testing by several engine component manufacturers is that many older engines experience a short period of time during engine startup where critical lubrication is insufficient between metal-to-metal lubrication points when using modern oils with reduced amounts of ZDDP/ZDTP. These same enhancers unfortunately have their down side. The phosphorus in this compound creates carbon buildup in engine bores and valve trains, and both compounds can also lead to the early demise of catalytic converters. For this reason, the industry has been phasing out zinc and phosphorus levels since 1994, when the American Petroleum Institute’s SH designation became the industry standard, and levels have been further reduced in each subsequent API rating for engine oils. Manufacturers have tried adding more boron to offset the effects of the reduced zinc and phosphorus levels; however, the dry start protection does not measure up to those using more ZDDP/ZDTP. This has opened up a whole new market for zinc/phosphorus additives for oil and many camshaft and engine manufacturers now recommend that an additive be used during initial break-in, and for regular use. So what can you do? There are products on the market that include zinc additives to help extend the life of your engines. Rislone, Aims Oil and Lucas Oil offer them, just to name a few. If you are like I am, I own several classic vehicles and want to keep them running at their peak performance. Having a premature engine failure is staggering, not to mention costly. 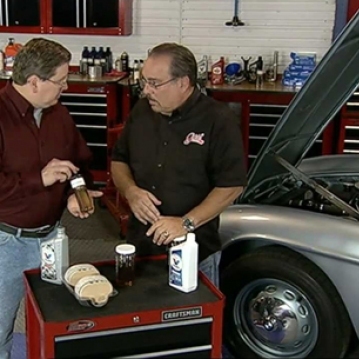 One important key is maintaining available lubrication in the current engine oils that you are using. On the back of the engine oil container, you will find the API rating, which explains the additives within the oil and also informs you if this oil is correct for your specific engine. Visit http://www.api.org/ for further information. Making The Best Even BetterWhy Should I Change My Engine OilWhat is the simple explanation of SEO and how can my business profit from it?